The SSCA Auction Committee is proud to present a “Back to the 80’s” Dance Party. We hope you can join us for what promises to be a rad event! Join us for a rockin’ evening of 1980’s fun with lively bidding in our silent auction benefitting the students of St. Saviour Catholic Academy. Enjoy hors d’oeuvres, cocktails, dancing and music with the SSCA Community! Interested how you can get involved or support the SSCA Auction? Buy a Mega Raffle ticket! These $25 tickets are a great way to try and win $5,000 while still helping SSCA! Buy one using the form that went home in your student’s folder or visit the front office. Attend… with a group! Plan on attending the event and spread the word. It’s even more fun to come with a friend. You don’t have to be a SSCA parent to attend! Volunteer! Contact the auction committee at auction@sscaparkslope.org for more information. Donate! Can’t attend and no time to volunteer? Here’s another powerful way to help! Use the Donate Now button on the right hand side to make a monetary contribution. Any amount is greatly appreciated! Tickets: $85 per person – available online at our Auction website, Biddingforgood.com. Additional Details: This is an adults only event. No tickets will be sold at the door. Need based financial aid is available to families who qualify! Please view the below powerpoint for more information about scholarships through Futures in Education. 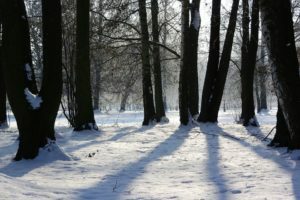 Enjoy the snow, and stay warm! The Breakfast with Santa Raffle Baskets are now on display in the lower level. Raffle Baskets will be on display on Thursday and Friday during the school day. See flyer attached. 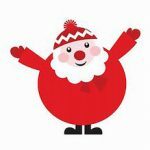 You do not need to be present at Breakfast with Santa to win! Each month we receive donations through Smile.amazon.com – an easy way for anyone to contribute to Saint Saviour. This week, Amazon is increasing it’s donation rate tenfold from 0.5% to 5% of the price of your eligible purchases to our Academy when you shop at smile.amazon.com/ch/46-0557485. AmazonSmile is the same Amazon you know with the added benefit of supporting charitable organizations. Check out AmazonSmile Settings for Your Devices for steps on how to setup your computer browser or mobile device, and thank you for thinking of Saint Saviour! 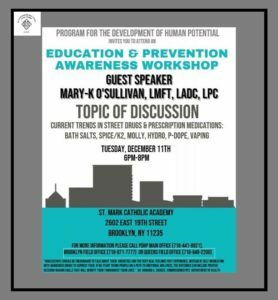 The Program for the Development of Human Potential invites you to attend an awareness workshop on Prescription Medications and their potential abuse at St. Mark’s Catholic Academy. This flyer updates the date of the event to December 11th, after inclement weather caused the November date to be rescheduled. Donations Needed – Fall Festival at SSCA! If you’ve got any uniform items that no longer fit your child, here’s a great way to clean out your closet! They’ll be used for the Fall Fest’s Uniform Table where you can purchase gently used items for a free will donation (suggested $1 per item). 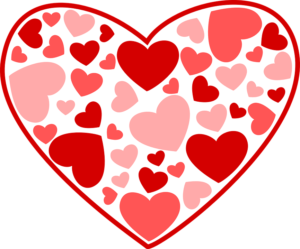 Bring in any of the following: shirts – white collared shirts or maroon polos, jumpers, skirts, pants, shorts, maroon gym uniform pieces, SSCA outwear. Where: Drop off in the After school area – box labeled ‘Fall Fest Donations’– Juice boxes, canned drinks (soda, seltzer), bottled water, single serving sized chips and pretzels. 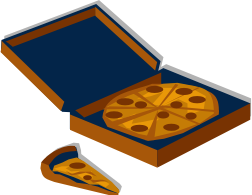 Where: Drop off in the After school area – box labeled ‘Fall Fest Donations.’ Please consider donating food for the Festival‘s very popular grill area: Hot Dogs, Hamburger Patties, Cheese. Generous donations like these make the festival hugely successful. We greatly appreciate any donation you’re able to make! If you are planning on donating, please sign up here. This will help the PA anticipate what will need to be purchased ahead of time. You can also use this site to sign up to volunteer for a shift during the festival. Each person who works a shift will receive FIVE free tickets as a thank you. Please volunteer if you’re able! Questions? Please email Chari Corpuz (mom to Jocelyn 3B and Risa KA) at chari_corpuz@yahoo.com. Got a chili recipe everyone loves? Register for The Annual Chili Cook Off! Winner receives 25 tickets to next year’s Fall Fest (what better way to defend your title?) 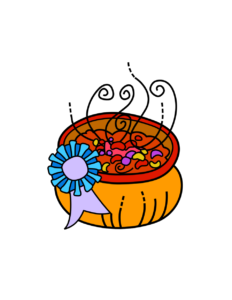 and… a special prize! We need a minimum of 10 entries, so please ask your friends to compete or feel free to submit more than one entry. Registration opens Wednesday, Oct. 10 and ends on Wednesday, Oct. 17. All chili is to be prepared and ready to eat ahead of the Festival. Chili drop off is from 11:45 a.m. until 12 p.m. at the grilling area with the Food Crew. Voting will be done by the tasters! Each person who wishes to participate in the sampling and voting will purchase 5 tickets that will allow for 5 samples of any of the chili offered along with 3 ballots. Tasters will cast their ballots in jars marked with the number corresponding to the different chilis. To enter the chili cook off or for more info, please email Chari chari_corpuz@yahoo.com.